Many personal informatics systems present users’ behavioral data in numbers or graphs for their reflection, which may not be effective on a daily basis because people do not always act like data scientists. Representation of behavioral data in virtual environments can provide information at a glance. Grounded in conceptual blending theory, insights from social psychology, and existing persuasive design principles, this article is conceptual-theoretical. 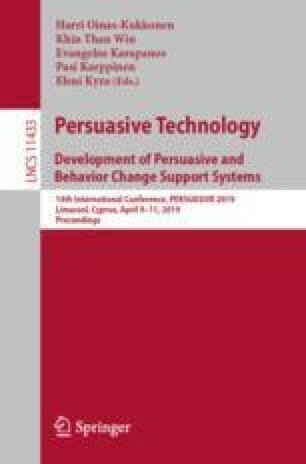 It argues that representations should be designed like virtual consequences of behavior and related to users’ existing knowledge of comparable cause-effect relationships in order to prompt one’s imaginative beliefs about the behavioral-virtual causality. It proposes a framework that guides designing representations of behavioral data, including (1) identifying scenarios with comparable causality, (2) examining and grounding the mappings in embodied experiences, (3) performing blends between the behavior and the identified scenario, with different virtual consequences corresponding to different user behaviors, and (4) rendering virtual consequences as feedback that dynamically anchors the scenario for similar blends in users. Design cases are presented and analyzed to demonstrate how embodied mappings can be constructed for interventions for lifestyle habits. This research benefits from projects supported by The Hong Kong Polytechnic University and Tung Wah Group of Hospitals.